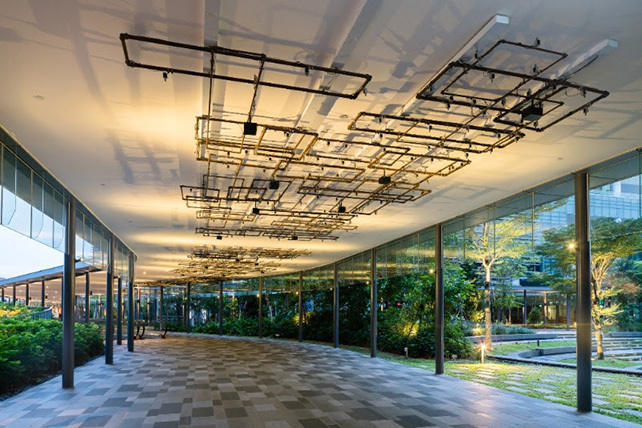 Zulkifle Mahmod, Sonic Pathway, 2017, copper pipes, 512 solenoids, microcontrollers, speakers, 250 x 1000 cm; 450 x 900 cm; 450 x 900 cm, Mapletree Business City II, installation view. On 16 August 2018 NTU CCA Singapore and Mapletree will mark the beginning of the Public Art Education Programme with a performance by reowned Singaporean artist Zulkifle Mahmod. Themed “Culture City. Culture Scape.”, the Public Art Trial at Mapletree Business City (MBC II) is curated by Ute Meta Bauer, Founding Director of NTU Centre of Contemporary Art Singapore and Professor, NTU School of Art, Design and Media, and Khim Ong, Deputy Director, Curatorial Programmes of NTU CCA Singapore. Commissioned by Mapletree, the new art installations nestled in MBC II are the works of internationally renowned artists. These installations include Elliptical Pavilion (2017) by Dan Graham (United States), Sonic Pathway (2017) by Zulkifle Mahmod (Singapore), Stillness in Motion – 3 Airborne Self-Assemblies (2017) by Tomás Saraceno (Argentina), and Wind Sculpture I (2013) by Yinka Shonibare (United Kingdom). On the evening of 16 August, Zulkifle Mahmod will be activating his work Sonic Pathway with a live sound performance. The artist invites the audience to experience a multi-layered composition, adopting different approaches to the medium sound by using recorded natural as well as his own electronic noises.